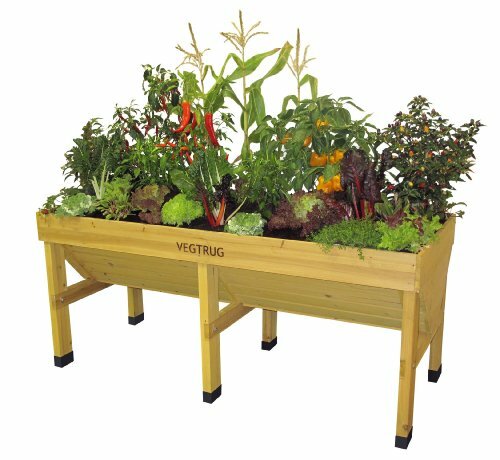 The VegTrug raised bed planter has enough room to grow up to 30 salads and vegetables at any one time on the patio, or in the garden with this great space-saving growing solution. You can grow all kinds of fruit and vegetables in your VegTrug Medium Wooden Planter with fittings to attach netting and fleece easily to protect your crops from frost and pests. The easy build design means it arrives in one box with easy to follow instructions. You can also watch our online build video on your tablet or other media device. The VegTrug is made from sustainable sources, comes with a purpose built, replaceable fitted membrane liner, keeping in the compost and with perforations to give good draining. This VegTrug is easy to work with; No more bending or kneeling and ideal for the elderly and wheelchair users.